On this page, all the products are listed with all the details. 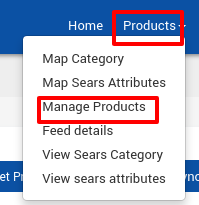 Admin can view more details of a specific product by using the View icon. Click the Get Product Status button. The statuses of the error-free products are updated in the App. Note: If there is an error in the product status synchronization process, then it appears on the page as shown in the figure. Also, a success message appears for the products whose statuses are successfully updated.